Thermoresponsive double network cryogels from dendronized copolymers showing tunable encapsulation and release of proteins. Smart hydrogels are attractive in many applications for example drug delivery, sensors and actuators. They tend to undergo corresponding changes in properties under external stimuli such as temperature, light, electricity, pressure, and pH. It was found out that the smart hydrogels have poor mechanical properties which limit their use in different areas for example in structural materials. Cryogels are a type of hydrogel with better mechanical property and micro-porous networks which are formed by preparing them below freezing point in water and they have shown to possess superior properties as compared to the hydrogels that are formed at room temperature. In particular, cryogels with double network structures were intended to produce better qualities of the hydrogels but only few of these types of hydrogels are available. 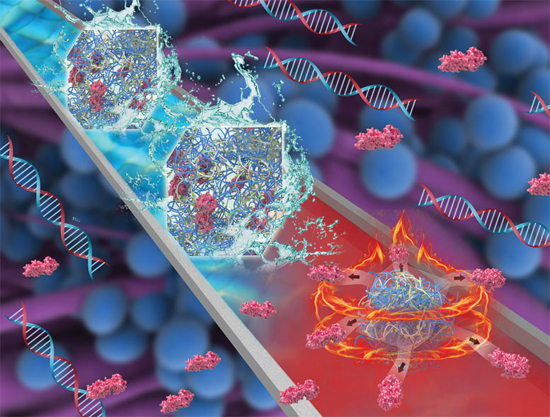 Recently, researchers from Shanghai University Professors Wen Li and Afang Zhang reported one kind of double network cryogels with improved mechanical using thermoresponsive dendronized copolymers. They aimed at forming cryogels whose properties would be incorporated in bio-related materials. Their work was published in the Journal of Materials Chemistry B. The research team prepared thermoresponsive double network cryogels by freeze-thaw gelation where the first group of cryogels was formed from thermoresponsive OEG-based dendronized copolymers containing triethoxysilyl groups with and without charged units. The second group of cryogels had PVA introduced to them in order to form strong H-bonding so as to improve their mechanical properties. The authors made careful investigations on the cryogels. They found that the double network cryogels exhibited characteristic thermoresponsive behavior. When the temperature was increased above their cloud points, the cryogels were dehydrated and caused their porous structures to shrink. This property was used to mediate encapsulation and release of proteins. The loading and release efficiencies of different proteins were dominated by hydrophilic to hydrophobic transitions of the dendronized polymer network and the individual properties of proteins. The cryogels also provided a shielding effect to the proteins from deactivation. At room temperature the cryogels could efficiently capture model proteins, while above the cloud points more than 80% of lysozyme could be released while the enzyme activity remained the same. It is important to maintain the bioactivity of proteins for their further applications since they are easily denatured by various environmental changes. In conclusion, the dendronized copolymer double network cryogels developed by Shanghai University scientists with the combination of thermoresponsiveness, porous structure and the loading and release properties show great promise in controlled therapeutic delivery and tissue engineering. Xiaoqing Feng obtained her bachelor degree in Materials Chemistry from Hebei University in 2015. She then worked in the group of Prof. Afang Zhang in the School of Materials Science and Engineering at Shanghai University, China, and received her master degree in Biochemical Engineering in 2018. Her research interests include intelligent polymers, hydrogel-based biomaterials and enzyme encapsulations. Wen Li received her Ph.D. in Polymer Chemistry from Swiss Federal Institute of Technology in Zürich (ETH Zürich) in 2010. She then joined the School of Materials Science & Engineering, Shanghai University, China, where she is currently an associate professor of polymer chemistry and materials. From 2016 to 2018 she worked as a visiting researcher in the group of Prof. David A. Weitz in the School of Engineering and Applied Sciences and Department of Physics at Harvard University. Her research interests include topological polymers, hydrogel-based biomaterials and droplet microfluidics. Afang Zhang received his Ph.D. in Polymer Chemistry & Physics from Peking University in 1999. He began his research work from 1988 at Chemistry Institute of Henan, where he became a full professor in 1998. After three years working at the Deutsches Kunststoffinstitut and Free University of Berlin, he joined Zhengzhou University in 2002 as the distinguished professor. In 2005, he moved to ETH Zürich and worked there as a senior scientist. By the end of 2009, he joined Shanghai University and leads a group working on polymer chemistry and biomimetic materials. Xiaoqing Feng, Jie Liu, Gang Xu, Xiacong Zhang, Xinyan Su, Wen Li and Afang Zhang; Thermoresponsive double network cryogels from dendronized copolymers showing tunable encapsulation and release of proteins : J. Mater. Chem. B, 2018, volume 6, page 1903-1911.